*The actual chest measurement of the tuxedo suit is typically 1-2 inches larger than the size of the suit to allow room for adequate movement. *Our Model Fit (M): Height: 6'1-- Chest: 39.37-- Weight: 176.37 lb. *Chest - Measure chest just under arms and across shoulder blades, holding tape level (don't hold your breath). *This mens floral tuxedo is different from other sequin tuxedo, this suit for men also can be used in your daily life. 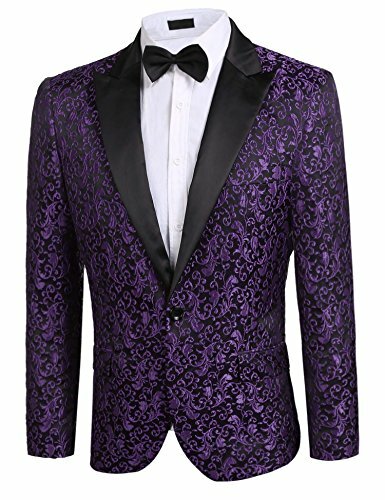 [WHAT'S THE UNIQUE PARTS] This Floral Tuxedo Jacket features the stain notch lapel, fake pockets, one button closure, four-button cuffs each sleeve, stunning curves. It is gentlemanly and stylish to go with the floral pattern printing. [HOW TO MATCH IT] This men jacket suits can match with your bottom dress shirt and suit pants. You can also match a stain bow tie to help you to improve your public impression. [WHAT KIND OF OCCASION DRESS IT] This blazer suit for men is perfect for all kinds of formal or informal occasions. Such as attend Weddings, Graduation Ceremony, Dinner/ Evening party, Graduation Party, Yacht Party, Banquet, Dating and Meeting; it also will make you be more attractive and charming when you dress is to give a public speech or as host. [SIZE NOTE] This tuxedo jacket suit has 7 different size: XS (US Chest:41.3 ), S (US Chest: 42.9), M (US Chest: 44.9), L (US Chest: 46.9), XL (US Chest: 49.6), XXL (US Chest: 52.4), XXXL (US Chest: 55.1). Please reference the left picture size chart or the below description size carefully before payment. [OTHER RECOMMENDATION] This blazer is suitable for Autumn, Winter, Spring, Summer. Please Dry clean only! Size test: Tony is 5'8" and 236 pounds, he wears XXL (50 - 52). If you have any questions about this product by Donet, contact us by completing and submitting the form below. If you are looking for a specif part number, please include it with your message.